Tampa, FL is a beautiful city for a person to set up an apartment or retail complex. However, Tampa property owners are not without their shortcomings. No commercial property is immune to fire damage, and with a lot on the line, it’s vital for property owners to have a professional commercial restoration company in their rolodex. 911 Restoration of Tampa is the exact company you need to call when a disaster strikes. Offering exemplary fire restoration services 24/7/365, we’ll be at your doorstep in just 45 minutes to start the fire cleanup process. When fire strikes, the damage and devastation can be significant. Even the tiniest fires can cause substantial smoke damage. Taking a toll on your personal possessions and resulting in unseen damage to your commercial property’s structure, the fire restoration process is time sensitive. Acidic in nature, it can affect each surface of your building differently, rapidly taking its toll unless swiftly addressed. Linens – Unburned chemicals, invisible to the naked eye, must be completely removed to get rid of smoky smells. Curtains and Upholstery – Vacuuming your upholstery and curtains with a regular vacuum’s standard brushes or beaters can force soot to go deeper, making the cleaning process more problematic. 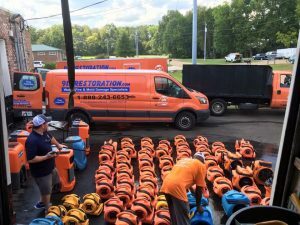 You need a fire restoration company that is equipped with the proper filter, hose attachments, and techniques to rid your items of the stubborn soot. Furniture and Carpeting – You may unintentionally damage carpeting and furniture further while cleaning it. Metal furnishings can rust and carpets can easily stain. Hard Flooring – Flooring could need replacement or refinishing, especially those damaged from water by firefighting techniques. Porous Hard Surfaces – Drywall, wallpaper, paint, plaster, and exposed wood can hastily become discolored permanently from smoke damage. Appliance Exteriors – If left unaddressed, they can quickly turn yellow within hours. Metallic Surfaces – Acidic soot can cause metal surfaces, including bigger appliances like refrigerators, to pit and corrode over time. Timing is everything when it comes to fire restoration and smoke removal. Within minutes, porous materials may become permanently discolored. Within hours to days, flooring, painted walls, wooden furnishings, and clothing can become permanently stained and metal surfaces can begin to pit and rust. Within weeks, prolonged soot exposure can embed itself in surfaces, causing expensive repair and a higher likelihood of replacement. This is why it is so essential to contact 911 Restoration immediately. We will be at your property location promptly and implement a plan to address all aspects of the fire cleanup process, ensuring that your business does not suffer from any disruption. about when a fire strikes. Their building can also become the victim of water damage due to fire crews trying to tame the flames. 911 Restoration of Tampa doesn’t just specialize in fire restoration, we’re experts in water removal as well. Water damage can take a huge toll on your business, so it’s essential to act fast and call us today. 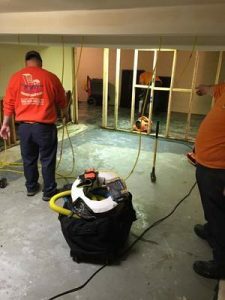 With our “fresh start” approach, our crew can not only remediate your water damage issue, but we can alleviate your distress during this difficult time. Our superior customer service skills put you at the focus of our attention, showing you that a new beginning is possible for you and your business. When you are in dire need of fire restoration services, 911 Restoration of Tampa is there for you. Day or night, we’ll be at your location right away to quickly remediate the effects of the flames. Contact us immediately if you have experienced fire or water damage as time is valuable when it comes to cleanup.